White tablecloths or fast-casual, San Diego’s best seafood restaurants come in every flavor. No matter if you’re looking to splurge on lobster and crab or just grab some fish tacos after a beach day, our ocean-centric dining scene has the right vibe for you. Wedged into a strip mall next to a 7-Eleven, on first glance Sushi Ota doesn’t appear to be a restaurant that sushi lovers far and wide would rave about. But step inside and you’ll realize the modest exterior and interior underplay a mastery for sushi and seafood presentation. It’s funny to think that before Ironside opened in 2014, the former fishing village of Little Italy had no dedicated seafood restaurant. This sophisticated bar and restaurant changed that. It also cemented the area as San Diego’s top culinary destination, and established itself as one of San Diego’s favorite places to get California black cod and yellow tail, lobster rolls, octopus a la plancha, oysters on the half shell, and high-quality cocktails. A classic seafood joint done right. Order at the counter, find a seat among the crowd at the Bayfront location, and savor quality seafood as it was meant to be done: With a harbor view, the sounds of distant seagulls, and an ocean breeze. Among all the fried seafood you’d expect, they also serve ceviche, poke, crab legs, and grilled market fish. The three families who started this joint in 2008 have long-held ties to the local fishing community, and can be trusted to do right by any seafood. At the center of Oceanside’s culinary awakening is this unique gem. There’s nothing traditional about this inventive sushi restaurant except a devotion to quality, sustainable seafood. Alongside classics like spicy tuna and shrimp tempura, you’ll find vegan sushi rolls, local beer and kombucha, and cupcakes in a funky setting. Never been to a sushi restaurant with The Clash posters on the wall before? Here’s your chance. This fine dining establishment with expansive ocean views has racked up ample media attention and award after award. Expect the highest quality modern American seafood, but in a San Diego kind of way: A laid-back setting where fish tacos, hamburgers, and a kids’ menu are comfortable alongside premium sashimi. Sustainable seafood, hip atmosphere, craft cocktails, impressive wine list. That is the winning formula for this new local favorite conveniently located in the Pendry Hotel. 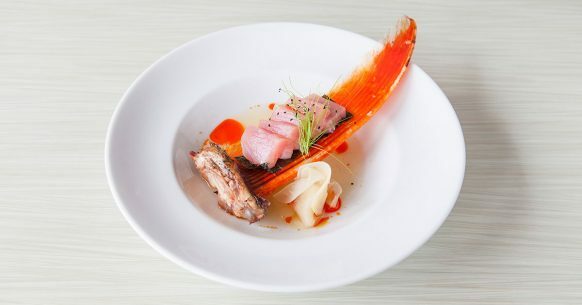 Sea-foodies will happily encounter cider-braised mussels, lobster carpaccio, and butter-poached King Crab leg, while those looking for maple-sriracha pork belly or New York steak tataki will be no less pleased. The casual, counter service concept here dates back to 1974 in the restaurant’s first iteration in Del Mar. And the simple made-to-order style has withstood the test of time. No matter how long the line is, you won’t regret it. Shuffle your flip-flop clad feet to the counter, choose from ultra-fresh fish and shellfish, tell them how you want it (grilled? in a taco?) and bask in San Diego’s seafood perfection.